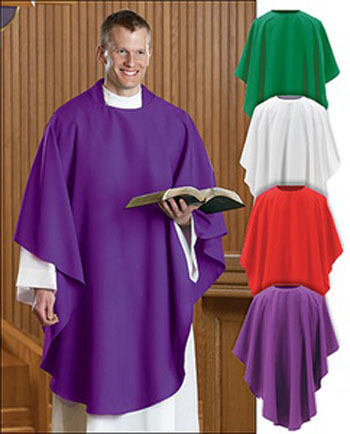 How many people in the Church today, whether clergy or laity, ever saw or heard of the clerical vestment known as the “folded chasuble” (planeta plicata)? Precisely. The Commission’s decision in 1956 to eliminate this symbol of penance is a sad, though unsurprising, indictment of the direction in which the reform was heading. Its disappearance from Holy Week, the season quintessentially dedicated to the Passion and Death of Christ, heralded its disappearance from all other penitential days of the liturgical year – at least what was left of them after the Novus Ordo reforms. In 1960, Pope John XXIII issued a new Code of Rubrics for the Roman Missal stipulating that the folded chasuble is no longer used. (4) This, of course, applied to the 1962 Missal. Those who maintain this position merely demonstrate the moral blindness in which the reform was conceived. A matter should be considered insignificant only if it can be demonstrated to be trivial and inconsequential. But how trivial was the abandonment of the folded chasuble, and what were the consequences of its suppression? When we look at precisely what that tradition sought to protect, we will see that the subject at the heart of this matter could not be less trivial. Such was the profound significance of the folded chasuble that it was linked in the mind of the Church to the divine precept of penitence which is especially incumbent on priests – more so than on the laity – as they are more closely conformed to Christ through the sacred character of their Ordination. It was once common knowledge that this liturgical garment expressed the priestly identity in clear and unambiguous terms: as an alter Christus, the priest is closely linked with the “Man of Sorrows” Who wrought our redemption from sin. Penitence was, therefore, intrinsic to the nature of the ordained priesthood. The necessity for performing works of penitence – which was also the urgent and recurring theme of Old and New Testament figures (7) and, in more recent times, of Our Lady of Fatima – was made perceptible to the priest (and to others) by a visible outward sign, the wearing of the folded chasuble. One could even say that the folded chasuble was an external reminder to the priest of his commitment to celibacy, interiorly assisting him on his penitential road to holiness. Where the “immense loss” was most evident, then, was among the clergy, as many would cast off the spirit of penitence together with their folded chasubles. This loss marked the beginning of the radical shift that eliminated the old rules and regulations about fasting, abstinence and penance understood as ascetical exercises. History has shown the extent to which the clergy would gradually lose any understanding of, or attachment to, the Church’s traditional discipline. Why is it that the immemorial custom of the folded chasuble, which had been received and approved by the Church throughout the centuries, came to an abrupt end in the mid 20th century? How come that a tradition which made such a prodigious contribution to the spiritual lives of the clergy suddenly became an item of the Church’s ancient past? As many incidents in the Protestant Reformation and in recent Catholic history have shown, liturgical symbols were suppressed in an attempt to stamp out or minimize the beliefs they stood for. Here we can see the underlying reason why Bugnini was so keen to ensure that the folded chasuble made its way out of liturgical history. The new liturgy that was being planned by the reformers would have no place for the emphasis on sin, penance and the unworthiness of man that prominently featured in the traditional liturgy. Such “negative” concepts would soon be in full retreat as a necessary consequence of the advance of the new “positive” view of the goodness of man ushered in by Vatican II. Indeed, the very concept of penitence was made largely irrelevant by Vatican II’s emphasis on the joys of being “liberated” from the so-called “prophets of doom” who preached about the guilt and shame associated with sin. Therefore, the folded chasuble would be viewed as an anachronism in the “renewed” liturgy where the spirit of penance and asceticism, so repugnant to modern man, would be played down, while the discipline of fasting would be relaxed almost to vanishing point. It is not surprising that both penance and sacrifice have been obscured in the Novus Ordo. 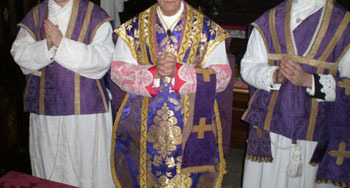 Furthermore at appropriate points in the liturgy, the Deacon would lay aside the folded chasuble and don the “broad stole” (stola largior) in its place, worn in bandolier fashion. It too has been eliminated. See note 4. “Nessuno…sentirà la mancanza delle ‘pianete piegate’” (no one…will feel the loss of the folded chasuble), in A. Bugnini and C. Braga, Ordo Hebdomadae Sanctae instauratus commentarium, Bibliotheca Ephemerides Liturgicae, Sectio Historica 25, Rome, Edizioni Liturgiche, 1956, p. 56, note 28. L. Gromier, ‘La Semaine Sainte Restaurée’, in Opus Dei, 2, 1962, p. 80. Pope John approved the new Code of Rubrics in his motu proprio Rubricarum instructum, of 25 July 1960, and imposed its observance on all who used the Roman Rite as from 1 January 1961. It mentions that folded chasubles and the broad stole are no longer relevant: Planetae plicatae et stola latior amplius non adhibentur. See AAS, 52, 26 July 1960, §137, p. 621. But, given that this is more an observation than a command, the question remains as to whether the immemorial custom was actually prohibited. Horace, Epistles, Book 1, Epistle 18, line 15. The literal meaning of the adage is to quarrel over goat’s hair. In ancient times, goat’s hair, being too coarse for making into garments (except the hair shirt), was used for such items as sacks, horse belts and fodder bags. In the Holy Week reform of 1956, the maniple was no longer used for Good Friday. The obligation to use it in the rest of the liturgical year ceased in 1967 with the Instruction Tres abhinc annos §25: “Manipulus semper omitti potest” (The maniple can always be omitted). The wording leaves the question open as to whether it was actually prohibited. Beginning with Noah who was the first preacher of penance, the Prophets were constantly crying out to the people to do penance for their sins. 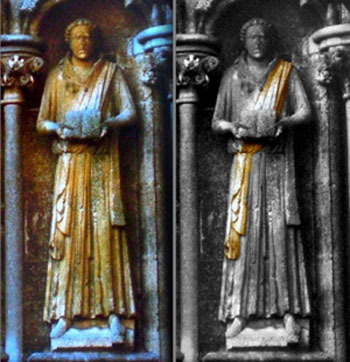 St John the Baptist preached the same doctrine which was reiterated by Christ on His own authority. The Apostles carried on the same theme as soon as they received their mission. From those times until our modern era, penance was a fundamental theme of all the Councils and of the Fathers and Doctors of the Church. It was also preached from every pulpit until the Vatican II era.